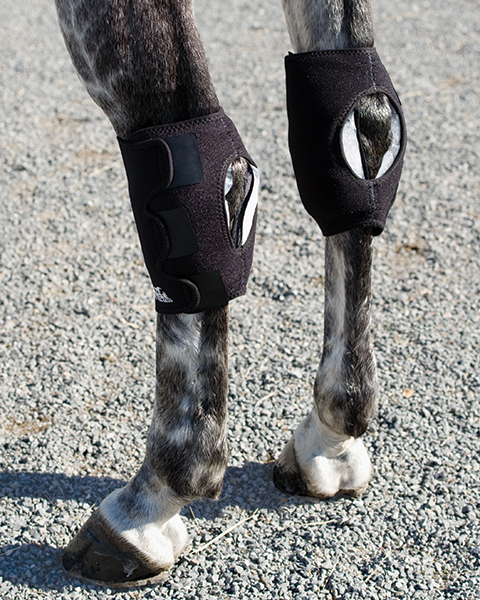 Easy-to-use Ice Horse® Hock Wraps provides uniform compression and coverage to reduce inflammation and heat in the front and back of the hock. The wrap is open over the cap bone, shaped, and sized to give full consistent compression and coverage. Ice Horse Wraps help reduce heat and inflammation and after work or injury. Ice packs packs mold to the horses legs for maximum coverage and stay cold for over two hours. Ice Horse® Hock Wraps are made with Quadrispan™ anti migration fabric. Our unique breathable fabric keeps the wraps in place on the horses leg and the ice compressed against the area being treated.